Accept a name and a score for a new entry on the board. If the name already exists, update the score with the new value. Return a JSON representation for a supplied name, including rank and score. Support HTML and JSON representation of all the entries on the leaderboard. Include the ability to specify page number (default to 0) and offset (default to 10). Do not allow more than 100 records to be returned for a single request. Allow for removal of a specified name from the leaderboard. All in all, the requirements are pretty straightforward. Basically, allow the user to create, update, and remove entries on the leaderboard. Also, return the current entries, ordered by rank, in either HTML or JSON format. ZADD: Add one or more members to the set with the specified scores. ZADD myzset 2 "two" 3 "three" will add 2 members. ZREVRANGEBYSCORE: Return all the members in the leaderboard found between the supplied min and max values. This is used to show the members from highest to lowest. ZSCORE and ZRANK allow the retrieval of members by score and rank, respectively. I am not the only one that thinks Redis works well for this use case. Github user agoragames has created a Ruby gem to make it even easier. The leaderboard gem not only makes using Redis for leaderboards easy, it adds a TON of features on top. If there was a leaderboard for leaderboard gems, leaderboard would be at the top. In this article, I am going to show you a very simple, Rails-backed leaderboard. 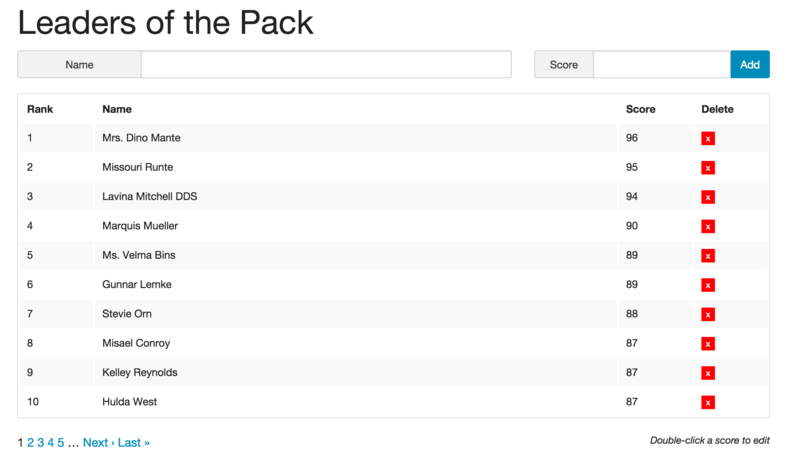 While some of the front-end behavior (i.e., paging) is Rails-specific, the leaderboard operations are not. You should, if you so desire, easily be able to take the leaderboard-specific bits out of this and use them in a Sinatra or Volt or Padrino application without any hassle. As you’ll see, I’ve placed all the code that touches the leaderboard into a set of service objects. I did this out of love. The leaderboard itself could be for anything. I am going to use the Faker gem to just populate it with names. This allows us to see many entries in the board and demonstrate what happens when we add new or update existing entries. I’ll share the Ruby script that creates the entries when we get to that bit. 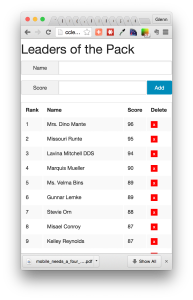 The code for this leaderboard app is here and a demonstration for the app is here. leaderboard: The gem we’re talking about here. faker: The gem to generate fake/test values. It’s used here to generate the names for our members. cells: “View Components for Rails”. Basically, view models for Rails. This is not necessary for the leaderboard, but I like them. kaminari: A well-known pagination gem for Rails. The leaderboard will be paginated. I also am using RSpec and PostgreSQL, so the necessary gems for those are in the Gemfile, too. The specs are not 100% complete, but they do cover the happy path. PostgreSQL is basically not being used at all, I am just too lazy to remove it. Next steps for this application would include authentication, and I’ll use PostgreSQL and Devise for that, more than likely. Basically, there is one leaderboard, so it gets a show method. The leaderboard is made up of entries, and Entry is a full Rails resource. Entries can be created with a POST to the collection route. All the entries can be obtained with a GET to the collection. Individual entries follow the standard Rails RESTful routes. I added a “Not Found” route just for completeness sake. It’s important to note that the only real HTML view in the app is to show the leaderboard. Everything else will be done via AJAX. I am using Angular for that (the sound of 100s of ReactJS users guffawing). Finally, for styles and layout, I am using Zurb Foundation (the sound of 100s of Bootstrap users guffawing). default_leaderboard returns the leaderboard used by the application. The service methods will default to this, unless they are provided a leaderboard explicitly. default_options holds the page size along with the default options from the leaderboard gem itself. You should click through and read about the various options of the leaderboard gem. The classes that do the work are explained below. Get the entries of the leaderboard. Options can be supplied, such as page and page_size. Get a single entry in the leaderboard based on name. Man, the leaderboard gem makes this so simple. Quickly check to see if an entry exists (member_exists? is in the Boards::Base class), then return that entry’s score and rank. Create or update an entry in the leaderboard for the given name and score. This will also return the page the entry is on based on the Leaderboard page size. Get the score and name from the parameters, then call rank_member. I added something extra to the end of this method to get the page that the new (or updated) entry is now on, based on the leaderboard page size. I use that to take the user to that page when the operation is complete. Also, this class is used to create and update entries, so there is no CreateService. Remove an entry from the leaderboard based on the supplied name. Just a simple call to remove_member with the name. Easy peasy. You may be wondering if I regret adding Service to the name of each of these classes. I do. The controllers will consume these objects and methods to perform the actions based on the user requests. The LeaderboardController has a single action: show. This action gets the entries for the current page of the leaderboard. The show method is pretty straightforward. It grabs the default leaderboard and calls the Boards::GetAllService to get the entries. If we are rendering HTML, the paginate method uses the incredibly useful Kaminari.paginate_array method. We’ll even get the total number of pages, since the leaderboard knows it’s total_members. I thought pagination was going to be more of a bugaboo than this, but the Ruby community has my back again. I am using the t (short for I18n.translate) method to get my strings out of the locale files. The entries will be displayed as a table (the sound of 100s of CSS pedants guffawing). This is just a simple form to add a new entry. It takes a name and a score. The delete form uses an HTTP DELETE to post to the specific entry. This is one of the reasons I like cells. I get focused bits of the view that are testable. The directive binds to a couple of events, one on the score element (dblclick) and one on the input (keyDown). The scope.editing boolean toggles the input on and off. Putting csrf on that form tag causes a hidden input with the csrf-token to be appended to the form. Nifty. I am not going to walk through each method here, as they all follow the same pattern: Call the right service object passing in the appropriate parameters, then render based on the format. There are couple of refactorings here that I’ll give you as homework. The destroy method redirects to the root path, which is gross. Your task is to make it all AJAXy and stuff. The application presented here only touches part of what the leaderboard gem offers. The Github page has all the info, but I’d like to call out a couple of features. This could be insanely useful if your leaderboard entries have extra data to tote around. There are 3 kinds of leaderboards (who knew? ): Default, TieRankingLeaderboard, and CompetitionRankingLeadeboard. The difference is how entries with the same score are handled. You are now armed with the knowledge to create your own leaderboards. From this point forward, I presume you will be creating leaderboards for everything. Let me know when you get the leaderboard called “Articles abount Ruby and Leaderboards” so I can vote for this article. Glenn works for Skookum Digital Works by day and manages the SitePoint Ruby channel at night. He likes to pretend he has a secret identity, but can't come up with a good superhero name. He's settling for "Roob", for now.